It has been announced today that E as Poetlove Water (Etaniel Ben Yehuda, me) is now one of the 10 FINALISTS for the ‘2012 Best New Author Award’ by the National Black Book Festival (NBBF) committee. I am elated! Well, the opportunity has presented itself to take art to share art abroad in West Africa! The Gambia, to be exact. I am very excited about the opportunity to connect with The Gambian youth. As I follow African tradition, I bring the gift of Creative Arts to the bright minds of The Gambia. Below is a map to give you a better idea about the small West African nation. The Gambia is the ancestral home to Alex Haley, author of Roots. The Roots miniseries has been listed as the most watched miniseries in television history. Mr. Haley introduced the world to Kunta Kinte. In the movie, Kunta adamantly defied the colonial masters’ request to accept an european name. I am very honored to serve the people that gave us Kunta Kinte. 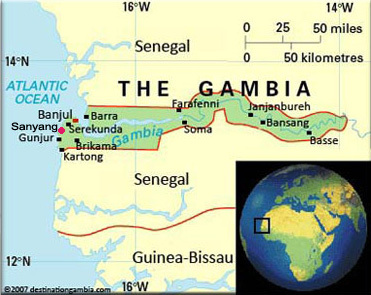 The visit to The Gambia is scheduled for Summer 2012. As the winds of life carry a small group of artists across “the pond”, we anticipate a life-enhancing experience. Currently, a program is being developed to provide workshops on Creative Writing, Painting, Drawing and Angolan Capoeira to Gambian youth between the ages of 12-21. Additionally, campaigns and fundraising efforts are underway to attain the necessary resources and financial support. I will keep you updated on the developments. In the meantime, please go to ‘Pieces of Life’ page to check out a poem by Giddo Jallow. The poem is entitled, “The Story of a Tree and the Bird”. Giddo resides in The Gambia and has become an adopted younger brother to me. He aspires to study Criminal Justice in the US by 2013. On Friday March 16th, ‘The Chronicles–Live’ hit Richmond, VA @ Black History Museum & Cultural Center of VA. It takes place from 7:30-9 PM and promises to offer great vibes, great food and the opportunity to received autographed copies of The Chronicles of Air, Water and the Source. The event is sponsored by The Nile Ethiopian Restaurant of Richmond. Check out the vid below…sneak peek at what’s to come!! !